The Closer to Nature feeding bottles feature a unique, easy-latch-on teat shape with breastfeeding experts to mimic the natural flex, stretch and movement of a mum’s breast. This encourages comfortable and relaxed feeding. Breast-like shape for a natural latch - acceptance guaranteed*. Flexes like mum for a comfortable feed. Anti-colic valve in teat to reduce air ingestion. Smooth silicone teat feels closer to skin. The most breast like feeding bottle with anti-colic valve. Easy latch-on teat - 97% mom recommended**. Always BPA and phthalate free for ultimate reassurance. Closer to Nature bottle is inspired by what babies love most: mum. With the most breast-like teat ever made, this bottle flexes like mum and feels like mum because babies prefer it that way. In fact, our Closer to Nature bottle has guaranteed acceptance and an anti-colic valve making it the best thing for baby since you making feeding easier for everyone. 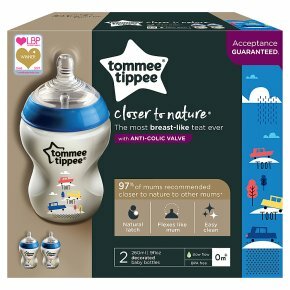 Tommee Tippee Closer to Nature bottles are only suitable for use with Tommee Tippee Closer to Nature teats. Important instructions and contact details included inside this pack. Please read and retain for future reference.